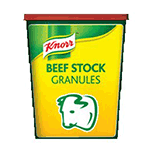 KNORR Beef Stock Granules add a rich beef flavour to soups, stews, sauces, gravies, casseroles and pies. Sprinkle on roasts, grills, savoury omlettes and snacks for extra flavour. NO MSG added. Product of South Africa.